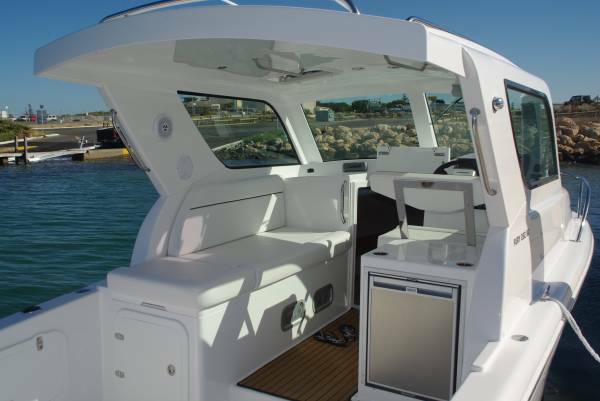 Vessels from Fury Custom Boats have typically been thought of as the epitome of the centre console style, and with good reason: centre consoles were all they built. 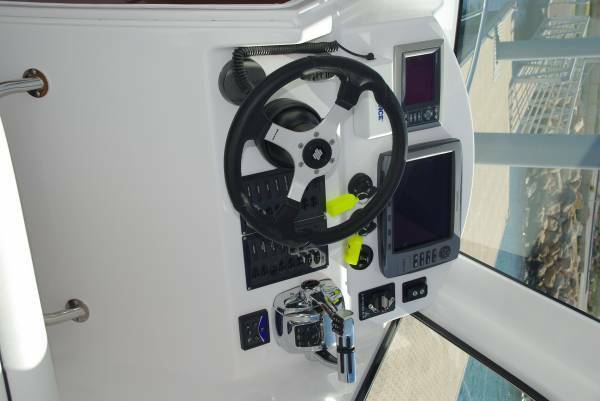 Until now, with the debut of the Fury 282 SC (for sports cabin). Using the familiar 8.6m hull of the centre console, this is a very big trailer boat. Even with the accommodation taking up space as many as ten people could get comfortable in the cockpit. 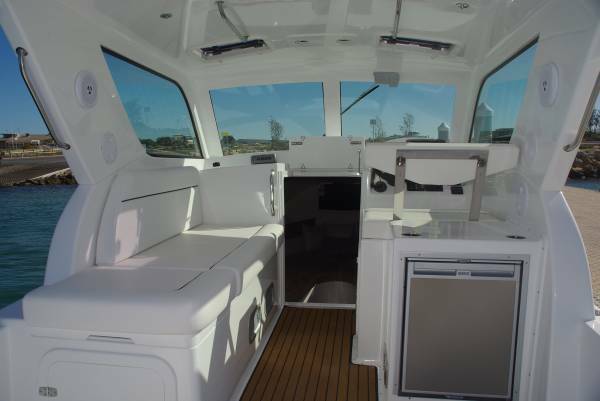 This boat will spend a lot of time on offshore fishing expeditions but, just as with the earlier boats, it will also be a very social boat. The accommodation and hardtop were always going to add weight, and had the potential of shifting the centre of gravity and marring trim. Calculations, and big and small modifications in design fixed everything. The biggest change was to construction in fibreglass-foam sandwich. 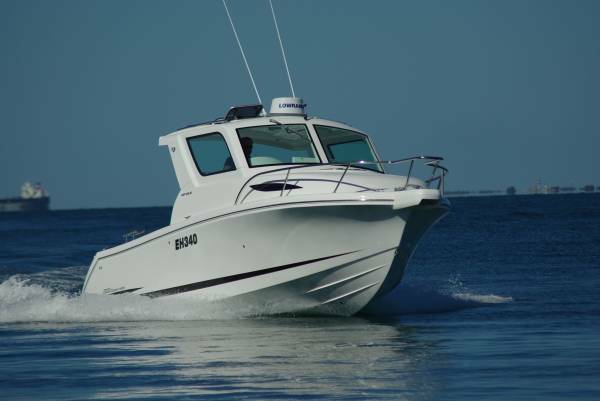 This greatly reduced weight and had the side benefit of making the hull quieter. Weight is significant for trailing purposes as well, and on an aluminium trailer can be as low as 3.4T. Twin motors and various options can lift that to 3.7T. The accommodation is laid out in the familiar style of a main cabin forward with the bathroom to one side, and another double cabin below the cockpit. The unfamiliar bit is the total absence of anything to do with cooking. This was a deliberate piece of design: the builder did some research and determined that almost nobody uses the galley in this size of boat, and why would they? Where is the joy in cooking below when you can do it in the open air, and who wants cooking odours embedded in the lining? Ban the galley and space multiplies. The main sleeping area converts easily from a sitting area with removable table, to a vast double bed surrounded by masses of storage space. The secondary sleeping space has a 2.4m long near-queen size bed, good headroom, plenty of light and ventilation, and easy access. The bathroom is thoroughly equipped, and has the hot, as well as cold, water supply that so many boats in this class miss out on. What downstairs definitely does not miss out on is quality trim. Above shoulder height everything is in stretch vinyl. Below that timber takes a substantial share, and special timber indeed: she-oak and silky oak clearly point out that this is an Australian boat. The finish is immaculate in absolutely smooth two-pack varnish. The cockpit separates itself into two parts, the hardtop shading the driving area that is raised above the aft cabin. The driver has a much wider seat than normal, and other occupants share a fore and aft settee that is long enough to make a fifth bed. The galley components are mainly housed within the structure of these seats. Lifting a section of settee cushion reveals the sink (sharing the hot water system), and the fridge with table above is behind the driver. These items make the inhabitants of the rear cockpit section an arms stretch from cold drinks instead of a walk away. Cooking is done on a barbecue above the transom. 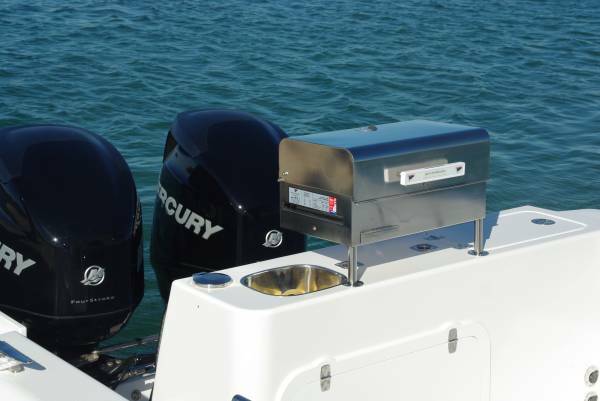 A settee normally sits in front of the transom, but with the barbecue in action – or the bait station that can replace it – the settee shifts to its alternate location on the port side. 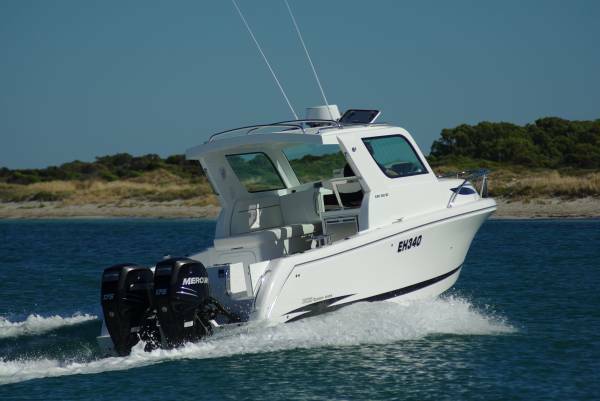 The transom houses the hot water system and the impressive battery array: a starting and a house battery for each motor. The electrics automatically give priority to charging the starting batteries, shifting to house when they are topped up. There is plenty of work for the house batteries: besides the fridge and a multitude of lights, there is a power windlass and a coaming-top capstan complementing the removable pot tipper. Storage has always been a feature of Furies, and besides the usual underdeck wet or dry lockers (two of them) and the locker below the driver’s seat, the thickness of the bulwarks is taken up by lockers instead of mere pockets. Motors are whatever make and power a buyer chooses. The review boat had a pair of 175hp Mercury Verado four-strokes, and these motors with electronic shift and power steering seemed a good match with the elegant Fury. The design calculations were obviously spot on – trim was as near perfect as I could pick it; the merest suspicion of trim button made the adjustments for our different headings. Driving was effortless, and comfortable sitting or standing. We had the sea conditions you would normally dream about, but which provided little to challenge the hull. 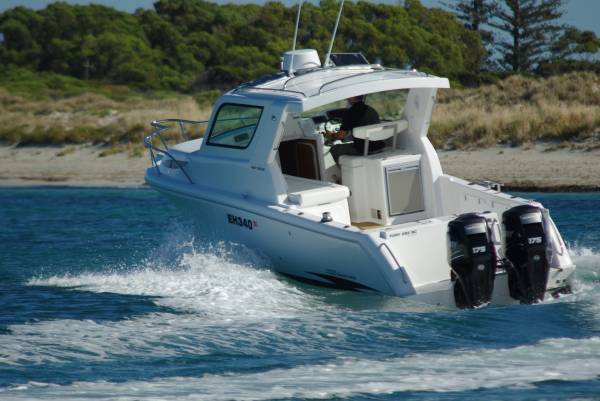 With virtually no sound from the hull, and not a lot from the motors, the Fury hit 43 knots in quick time. At a fair percentage of that speed we threw the boat around to our hearts’ content and found no trace of a vice. 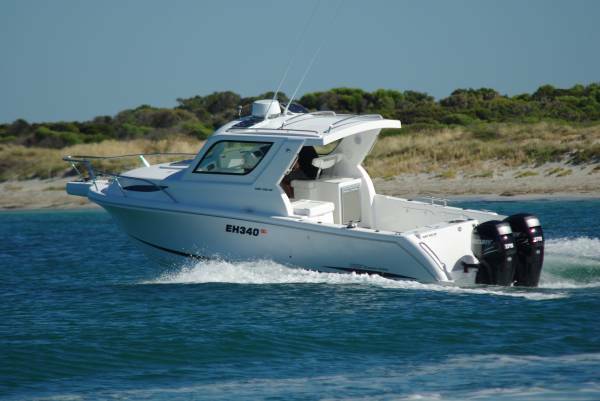 Being locally built in small numbers, the Fury 282 SC is available with whatever level of fit-out and equipment a buyer chooses. 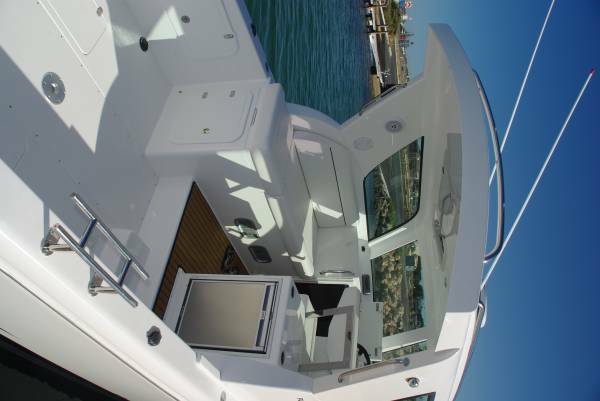 You can pay as much as $265,000 or as little as $190,000; anywhere in that spectrum is value, but at the bottom end you get an awful lot of sophisticated boat for your money.